Self-guided cycling tour from Bordeaux to Toulouse along the Canal. 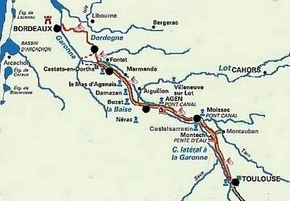 The Canal de Garonne,classified as World Heritage by UNESCO,is lined by cycle paths and small flat roads. It is often lined with plane trees, and crosses varied landscapes as vineyards, groves, orchards, villages and numerous works of art and historical monuments. Greenways, trails and the Canal locks lead you to Toulouse and Bordeaux, two major cities of France with exceptional cultural heritage. The accommodation in 3 star hotels and guest houses offer convivial comfortable stops each evening. 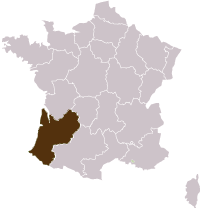 The departure point can both be Toulouse or Bordeaux. Arrival in Bordeaux "city listed as Unesco World Heritage"
This route allows you to discover the Entre-Deux-Mers region of 55 km of track / greenway and lanes ... Enchanting! Leave Bordeaux wih the track that runs along the Garonne River and its beautiful quays, then follow the greenway trail, winding through the hillsides of the Entre-Deux-Mers through Creon and Sauveterre de Guyenne, which are magnificent fortified walled towns. Finally reach your accommodation by small roads surrounded by vineyards. Night, dinner and breakfast in a charming Guest House. The greenway crosses vineyards and forests and several small stations. The track is easy and is a real immersion in nature. This shorter stage which lead to Marmande and its charming guest house or Hotel*** in Marmande or 10 km before. The tour continues in the rich valley of the Garonne and orchards. The lovely road between Buzet and Meilhan-sur-Garonne and under large plane trees, passes by Buzet-sur-Baise, Le Mas d'Agen and many other pretty small towns. One of the most beautiful stages with numerous points of interest. The easy road under the shade of plane trees take you to great sites such as: The canal bridge on the Baise, the aqueduct of Agen Auvillar, Lake Saint-Nicolas-de-la -Grave and finally Moissac. The Canal de Garonne dotted with charming of rural villages in Tarn-et-Garonne, with specific towering Gothic style churches. Visit Montech, its marina and “water slope” unique in the world. This peaceful stage, shaded by plane trees, ends by bustling last miles to enter Toulouse directly to the heart of the city, a real comfort! Take the entire day to visit the Pink City with its famous Place du Capitole and the ancient riverbanks. Night and breakfast in 3stars hotel. Possible extra night in Toulouse.